I don’t mean the food or the company. I mean dread-filled, the real thing. We were four friends at The Gables in Santa Monica, a newish café that doesn’t need a name or a menu. They could just hang a sign with a giant avocado above the door and you’d know immediately what kind of place it is: light-filled and comfy, with flat whites, grain bowls, local IPAs, a stand-out smoked trout Nicoise, and avo toast. It’s the kind of place hipsters dream of one day owning but likely won’t because they drop $14 on avo toast at places like The Gables. Our conversation started dark—Justice Kavanaugh had just been sworn in—and quickly got darker. Monday morning brought news that the latest report from the cautious, judicious Intergovernmental Panel on Climate Change (IPCC) warns that humanity has just 12 years to slow global warming to moderate levels or else we face the complete destruction of the coral reefs, mass species extinction, universal coastal flooding, famine, disease outbreaks, a world full of refugees and the loss of some 10 million lives. And our grandchildren? They’ll be pissed, and rightly so. You saw the train coming right for us, they’ll say, and you just…stepped out of the way? At that moment, when we are looking into their doleful, accusatory eyes, blaming some bogeymen from the past like Mitch McConnell or Donald Trump just won’t cut it. Our grandkids will want to know what we ourselves did while Rome was flooding. The IPCC report makes clear that to avoid the worst case scenario—which, you need to understand, is inevitable, if we do nothing—we need to achieve net-zero greenhouse gas emissions by 2040. Think of the movie Independence Day, when humanity must join together to fight the aliens, except, we’re the aliens. That means massive changes in how we approach transportation, land use, energy and diet. Diet matters. Livestock production is a major contributor to global warming. Over 14 percent of human-caused greenhouse gas emissions come from livestock production. A major culprit: cow farts. It’s not funny, because it’s true. A cow’s digestive system is a methane generator, and farts and belches make a particularly odious greenhouse gas. Each of the planet’s 1.5 billion cows produces 30-50 gallons of methane each day. It adds up. In fact, the IPCC’s 2006 report underestimated the impact of livestock methane by 11 percent. If the accumulated impact of all those billions of individual cows is a warmer planet, then think for a moment about the accumulated impact of billions of individual people reducing their intake of beef and dairy. The problem is that many Westerners feel doing without meat, eating a vegetarian meal, is a punishment. Often, they’re right. Vegetarian restaurants that proclaim they’re vegetarian, like meditators who proclaim they meditate and Harvard grads who announce they’re Harvard grads, have earned our suspicion. “Cashew cheese,” a standard substitute at high-end veggie places in LA, makes my stomach produce cattle-levels of methane for days. Then there’s Annapurna Cuisine restaurant in Culver City. Just like the Jonathan Gold-made-famous Mayura down Venice Blvd., Annapurna is located in a corner strip mall, one that hosts a well-stocked Indian market, and, because this is LA, a Thai restaurant. For months now the light illuminating the restaurant’s name seems to be out, or off. At night, Annapurna Cuisine, named after the world’s tenth highest mountain, is almost invisible. The cooking, as at Mayura, is Southern Indian: fragrant spices, chilis, sweet chutneys and cool raitas. 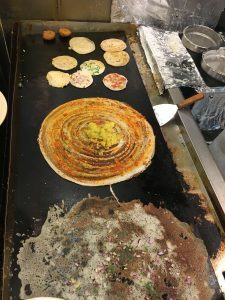 Southern India is also home to the dosa, a giant crepe made from fermented rice and black lentil batter. 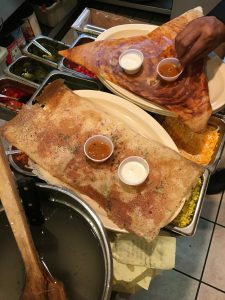 At Annapurna, the dosa man is front and center. He is tall and thin, with jet black hair. He pours out a batter, then spreads it out on a large griddle by drawing the back of his ladle in ever-widening circles. When the crepe turns brown and shiny on one side, he flips it, crisps the second side, then either rolls it into a tube, a cone, or into a triangle around some filling. Every table has a dosa or two. The spinach masala dosa comes folded over a oozing stuffing of spinach and potato. The crisp butter dosa looks like a mini-volcano. If there is a better way to get kids excited about eating fermented grains and legumes, prove it. Well, maybe utthappam. Take that dosa batter and pour it into a thick, pancake-like shape. As it sets, dot it with masala, or chopped tomatoes and onions, or fresh paneer cheese and vegetables. These split the difference between pizzas and flapjacks. The menu is long. Biriyani rice comes with mixed vegetables and a jolt of coriander and garlic. The more familiar curries include a bahara baingan, in which eggplant is melted down with ginger, garlic, maybe a touch of mustard seed, until it’s a warm, comforting jam. Among the items listed under “Annapurna Specials,” the “Special Paratha with Korma” features buttery, flaky flatbreads beside a brownish stew of peas, potatoes and onions. Use the paratha to scoop the korma, drizzle on some bright green cilantro and chili kothmiri chatni, and dip into the pumpkin-colored bowl of sambar. Sambar, the southern Indian dish with tamarind, pureed lentils and curry leaves, comes with just about everything here. It works particularly well as a dipping sauce for the appetizer plate, which features idly, plain, white steamed rice and lentil cakes, the donut-like fried version, vada, a heavy pea and potato samosa, and the crispy onion pakora, which come sheathed in a crackling garbanzo bean batter. This is not newfangled Franken-vegetarian food. 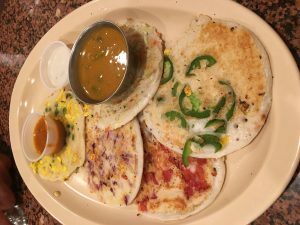 The earliest recorded recipes for dosa date back to the first century. This is an ancient, time-tested cuisine that happily marries beans, grains, vegetables, yogurt and spices. It is satisfying, sensuous food. The waiters seem to spend as much time running blocky wooden high chairs from table to table as they do taking orders and serving food. Kids and their parents sit beneath large TVs playing Bollywood movies, Indian music videos or cricket matches. Before the children get restless, an Annapurna-shaped dosa will appear before them. The place is family-budget friendly too. The most expensive item on the long menu is $9.95. Four adults can eat their fill at Annapurna for about $60, including a 20 percent tip. To drink there’s mango lassi and warm masala chai. Chaas, a cold buttermilk drink mixed with chili, salt and cilantro, is perfect for counteracting the burn of the hottest dishes. There’s no alcohol, and, yes, there’s no meat. Last Monday, I found that fact particularly comforting, if not empowering. Eating at Annapurna, I may be lightening the atmosphere’s carbon load by just half a hair, but I do reduce my personal sense of hopelessness, anger and dread. We have to start somewhere, hey, why not at dinner? 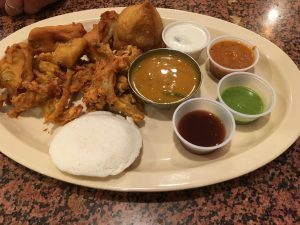 Reviewer’s Notes: I ate at Annapurna Cuisine twice, and sampled about 13 items from the menu. For more about these reviews, click here. Subscribe to this blog to get my weekly review delivered to your inbox. And be sure to share. All photos by Sari Thayer. I said to the almond tree, ‘Sister, speak to me of God.’ And the almond tree blossomed. Copyright ©2019 · Foodaism.com - All Rights Reserved.